"BIRI GOJA" (Steamed rice dumplings with savory black gram stuffing). 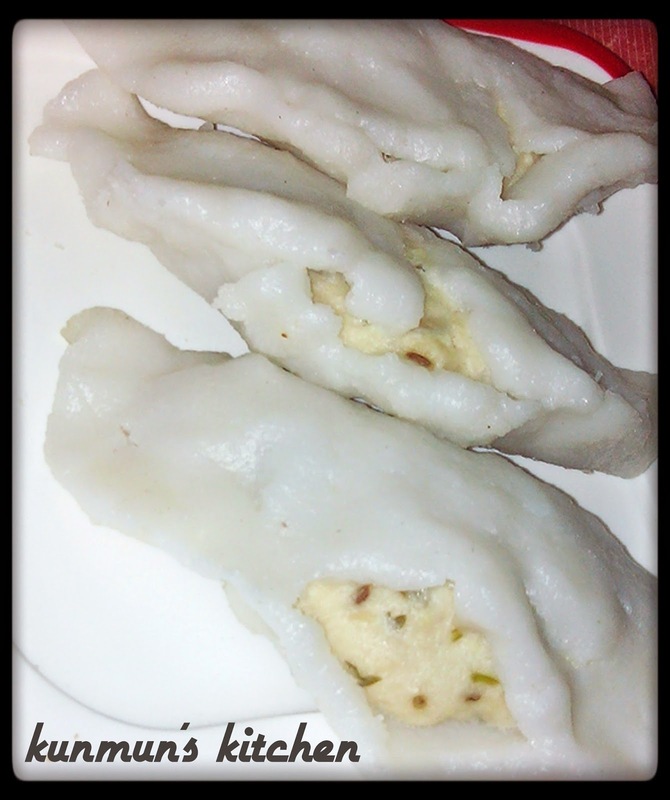 It is one of the typical and traditional Pitha of Odisha. Put water in kadhai or a wide pan, add little salt and let it boil. Add rice flour slowly by slowly in small batches and stir continuously. Make sure that no lumps will remain in the dough. Remove it from flame. Now knead the rice dough with wet hand, so that the dough will not stick to your hand. Onion finely chopped - 1 no. Green Chilly chopped - 3-4 nos. Soak the black gram for 1 hr and make a fine paste in blender. Add all the ingredients to it and mix it well. Divide the dough into lime size balls, make covers as shown in figure. Put the filling in the center. Make sure that there should be some openings in middle portion. Add water to your steamer and when water start to boil put it and steam for about 10-15 mins or till done. Cool it and serve with any chutney or curry.